VapeSling® V3.0- released on Oct 1st 2016. Featuring fabric slings for extreme comfort as well as reliability. VapeSling® V2.1 released on Aug 2nd 2016. Featuring the sewn on paracord fasteners. Strong and now washable. Note: All VapeSling products fit All (industry standard) 510 connections. On July 10th 2015, we moved from our former, tiny operation, into our new manufacturing facility in Henderson, NV. We now produce every aspect of VapeSling® E-Cig Vape Holders “in house”. VapeSling LLC made this move to produce a premium, high quality, yet affordable product for our customers. Previously, we used manufacturing resources in the U.S. for our cradle to be machined. This arrangement resulted in high costs and therefore drove our product prices up. 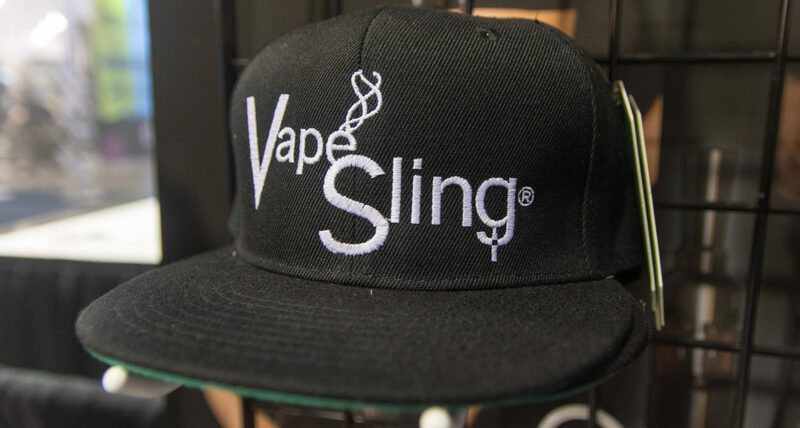 Now, in our new, fully equipped, manufacturing facility, VapeSling LLC can produce and assure consistent quality in all VapeSling E-Cig/Vape Holders, at an affordable price. When driving or Riding: Has your Vape become a flying and dangerous projectile? Do you fumble for your vape? Do your eyes wander off the road to look where your Vape is? Broken or damaged Mods: falling from hand holding, pockets, pouches, clips, etc? Have you ever used a Vape holder that allows vaping while securely holding your Vape…really, SECURELY? With VapeSling, driving or Riding while vaping is safe for you and those riding in your car. Your Vape is secure and at the ready for a relaxing vape while your eyes remain on the road. Your vape will remain a vape and not a missile. Your Mod will never break because our Slings will never break nor let go. We guarantee it for Life! All our VapeSlings support all your vapes. Mods of any size, shape or weight can be held. As we all know, Vaping is not an easy lifestyle. Holding a vaping device can be obtrusive to your daily life. With a VapeSling, your hands are free to live your life again, plus, you can vape easily at any time. Our most essential benefit for VapeSling users is the ability to vape while you carry. Your Vaping Device is held safely and comfortably on your body and at the ready to vape. Whether a RDA or tank user, e-liquid leaks from your atty to the battery are mostly unavoidable. However, when attached to your VapeSling, leaks simply stay on the liquid proof canvas waiting for you to wipe it. Our proprietary canvas has a double layer of PVC for strength, yet also serves to prevent liquid from seeping thru. Your battery will never lose contact due to liquid spills. VapeSling is the only concept vape holder to Vape and Go securely. The rest are simply unsecured storage. Click here for the Half-Pint style. Please view this ZIPster HP™ demo for installation instructions. Whether on the move or relaxing at home, the user can carry their E-Cig / Mod comfortably, securely, and always ready to vape. Additionally, there is no cumbersome retrieving or re-depositing of your e-cig/Mod into a case, pouch, bag or pockets. Most importantly, while E-Cigs or Mods are attached to VapeSling E-Cig Mod Holder Slings, there is no possibility of it falling to the ground. Every model of our innovative VapeSling® E-Cig Vape Holders have been tested for comfort and strength using every personal vaporizer and Mod device available on the market. Handling the smallest and largest device sizes, weights and shapes (Box, Cylindrical, etc.) comfortably and securely. Driving: Your vaporizer is at the ready. Eyes on the road and not searching for your vaporizer/Mod. Riding: Vaping while riding a bike or motor bike is now possible. Your Mod is at the ready for unrestricted vaping at all times. Weight distribution: Our MODster and ZIPster models are cross-body slings designed for today’s heavier 18650, 26650 and multiple battery Box Mods. Weight is distributed diagonally, across your body, thus achieving the best type of carry for heavier Mods. Never lose your Mod in your own house or wherever you go, again. Drip Vape with ease. No need to lay or set your Mod on a table to drip in your e-liquid. Drip right into your atty while on your body and attached to your VapeSling. Drip Guard: Our liquid-proof canvas cradle will catch e-liquid spills from your Atty. E-liquid will remain on the canvas cradle (till wiped off). Atty Liquid spills will not reach your battery terminal. Inspect your RDA coils while attached. Remove your atty cap; work any needed work; replace your cap and Vape on. Battery replacement: All replaceable battery mods can remain attached to your VapeSling when replacing spent batteries. Flood prevention/fix (Clearomizer and RBA mostly) – flip e-cig end over end while attached to your VapeSling; After a few seconds, the flooded e-liquid evacuates your coil thru the mouthpiece. Wipe off the mouth piece end. There are no Voltage drops whatsoever. This includes HYBRIDS! See our Voltage test using a Phantom Hybrid Mod. Note: All Slings will hold, box, cylindrical or any other geometrically challenging MOD/E-cig shape. All Mod weights supported. Considering their size and beauty, MODS have drawn little respect from the holder market…until now! Hands free carry, never vaped so good.